Alfredo De Massis is Professor of Entrepreneurship & Family Business and the Founding Director of the Centre for Family Business Management at the Free University of Bozen-Bolzano, Italy. He is also Chair in Entrepreneurship and Family Business. His research focuses on innovation and strategic management of family enterprises. In September 2015, Family Capital ranked him among the world's top 25 star professors for family business, and in March 2018 the International Family Enterprise Research Academy (IFERA) in a review of "Rising Stars in Family Business Research" included six of his articles among the most influential recent ones on family firms worldwide. He serves as Associate Editor of Family Business Review and on the Editorial Boards of Entrepreneurship Theory & Practice, Strategic Entrepreneurship Journal, and Journal of Family Business Strategy. His research has been published widely in leading academic and professional journals including Academy of Management Journal, Entrepreneurship Theory and Practice, Journal of Business Venturing, Journal of Product Innovation Management, Academy of Management Perspective, Family Business Review, California Management Review, Academy of Management Learning & Education, and has been featured in various media outlets including Financial Times, Harvard Business Review, CNBC, Campden FB, Tharawat Magazine, and he is regularly interviewed in TV programmes, newspapers and magazines on family business issues. Dr. De Massis serves on the Advisory Council of Harvard Business Review, on the Honorary Advisory Board of the Universal Scientific Education and Research Network (USERN), on the Academic Advisory Board of the Institute for Family Business (IFB) Research Foundation based in London, on the Board of Supervisors of the Grenke Centre for Entrepreneurial Studies in Berlin, on the board of directors of a private company, and he is the former Chair of the Family Business Research SIG at the European Academy of Management and the former Chairman of the European Leadership Council and Global Board Member of the Global STEP Project for Family Enterprising at Babson College (USA) engaging over 200 leading scholars and 85 enterprising families from 45 countries. He has been invited for visiting scholar positions and other speaking engagements in China, France, Netherlands, Sweden, Switzerland, Austria, Germany, Spain, Lichtenstein, Greece, Portugal, United Kingdom, Belgium, England, Germany, Czech Republic, Italy, Canada, Chile, and the USA. 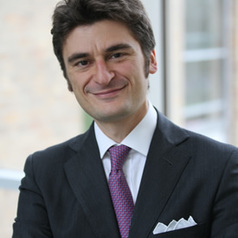 In 2018, he launched, in partnership with the London Stock Exchange and Dr. Josip Kotlar, an innovative executive program on "Leading Family Business Re-Generation" designed to equip family firm owners and managers with an in-depth understanding of how to approach equity markets and how to strike the right balance between tradition and innovation in their own expansion strategies. Since January 2017, he serves as columnist for Tharawat magazine, one of the leading magazines for family business leaders and experts, for a series of practice-oriented articles on "Secrets of family business innovation." Prior to his academic career he was manager at SCS Consulting, senior consultant in the strategy service line of Accenture and financial analyst at the Italian Stock Exchange (London Stock Exchange Group). He has been Guest Editor of 13 special issues in journals like Strategic Management Journal, Entrepreneurship Theory and Practice, Journal of Product Innovation Management, Global Strategy Journal, Family Business Review, California Management Review, International Journal of Management Reviews and Small Business Economics.